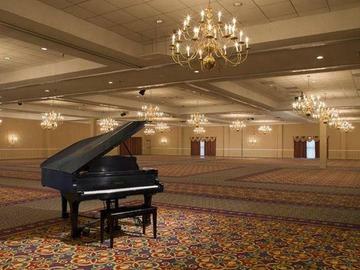 Option 1: First Floor Ballroom - $250.00 each table with discounts for three or more tables. Electricity is available for an additional fee of $25 for the weekend in the ballroom. Option 2: Second Floor Complete Vendor Room - Price varies by room size; see ticket descriptions for pricing and room dimensions. There is no extra charge for electricity on the second floor. You will get a single room with lots of extra space for other items that you might need to bring for your set-up. These rooms are ideal for special set-ups such as a tattoo artist, green screen photographer, or fortune teller/tarot card reader. You can even team up with some buddies to populate the room. The number of tables included in your room is noted under that particular room option. If you need extra tables, they may be purchased at $35 each. The extra table option is available ONLY for a full room purchase. Please note that the extra tables do not come with extra vendor passes. A full room purchase comes with TWO vendor passes included. Extra passes are available at half price as usual (limit 2). Option 3: Second Floor Mixed Vendor Area - This is for those who want a discounted vendor table in the second floor area. This entitles you to one table, two passes and electricity. The exact location of your space will then be determined as sales progress. Vendors MUST check in at Event Registration and receive their wristbands BEFORE starting to load in to the vendor area. Vendors are allowed into their areas 30 minutes prior to opening time on Saturday and Sunday. Please read the following rules and policies regarding the Scares That Care! Charity Weekend. If you have any questions or concerns, please contact brian.novak@scaresthatcare.org BEFORE registering for the event. By purchasing a vendor table(s) you confirm that you have read, agree to, and will comply with, all rules and policies as stated below. 1. All vendor/exhibitor spaces should be manned at all times. 2. Vendor/exhibitor spaces must remain intact throughout the public hours of the event. 3. Electricity is available for an additional fee in the First Floor Vendor Room; you must note if you will need electric at time of reservation and purchase the electric upgrade ticket option. Electricity is included at no extra cost in the Second Floor Vendor Rooms only. Outlets will be located as close to your table as possible. Please bring any extension cords or other miscellaneous items (tape, adapters, etc.) which you will require to utilize electricity. 4. If any vendor has special requirements including but not limited to large display racks, easels, stand-ups, etc. they MUST be cleared by Scares That Care! staff at the time the space is booked. This includes any special requests for table placement, wall space, neighbors, etc. There are spaces on the order form to note all of these things. PLEASE USE THEM. Vendors may not hang anything in any areas of the hotel except within their own vendor area. You may leave cards, pamphlets etc. on the freebie tables that are scattered throughout the event floor. 5. All vendors agree to hold blameless Scares That Care! and all Scares That Care! staff members/workers as well as Double Tree By Hilton entities, employees and agents, against any loss, damage, theft, expenses, claims or actions arising from any personal or property damage, loss or theft due to said vendors participation in the Scares That Care! Charity Weekend. 6. In addition, all vendors acknowledge that Scares That Care! and all Scares That Care! staff members/workers as well as Double Tree By Hilton entities, employees and agents will NOT provide or maintain insurance coverage for vendors, persons or property and it is their sole responsibility to obtain insurance covering such loss. 7. Scares That Care! in no way endorses any vendor's merchandise, exhibits, views, beliefs, or actions. All vendors are deemed to be their own business/entity and in no way reflect the views, beliefs, intentions and/or direction of Scares That Care!. Vendors do not represent Scares That Care! in any way. 8. All merchandise bought or sold at the Scares That Care! Charity Weekend is deemed to be a transaction strictly between vendors/sellers and attendees/buyers. Scares That Care! and Scares That Care! Charity Weekend are not party to or responsible in any way for any transactions made between said parties. 9. No pornographic, illegal, stolen or copyright infringed merchandise please. Violation of this may result in vendor being asked to leave and there will be no refunds of vendor table(s) purchased. 10. Please also be aware of Virginia wildlife regulations regarding the sales of wildlife items. Code of Virginia 29.1-521(11). See the law here and pay attention specifically to section 11. 11. NO REFUNDS will be given on any table spaces after May 1st, 2017, and will only then be given in the event the table(s) are rebooked. No refunds will be processed until 30 days after the close of the event. Vendors with 1-2 tables get two vendor entry passes. Vendors with 3 tables or more will get one vendor entry pass per table purchased with a maximum of six (excluding extra tables rented for second floor full room purchases). Vendors may purchase up to two additional vendor passes at half the weekend general admission price. Discounted additional passes must be purchased here on this page along with table(s). Discounted vendor passes will NOT be available at the event. 13. All tables are 6 ft. long x 3 ft. wide with 3ft of space behind the table. This makes each space (including table) 6ft x 6ft. Table cloths are included. Vendor will not be allowed to take up more space then they have purchased, so please purchase the appropriate amount of space that your setup requires. All payments must be made through Ticket Leap. Tables will not be held without payment. All tables/spaces will be reserved on a First-Paid, First-Served Basis. 14. Vendor passes will NOT be mailed. You will receive an email 3-4 weeks before the event with further information and your passes can be picked up at the registration booth located at the event during vendor check-in hours. PLEASE BRING YOUR TICKET LEAP BARCODED TICKET FOR EASIER CHECK-IN. Please feel free to contact brian.novak@scaresthatcare.org if you have any questions. NO REFUNDS will be given on any table spaces after May 1st, 2017, and will only then be given in the event the table(s) are rebooked. No refunds will be processed until 30 days after the close of the event. Vendors with 3 tables or more will get one vendor entry pass per table purchased with a maximum of six (excluding extra tables rented for second floor full room purchases). Vendors may purchase up to two additional vendor passes at half the weekend general admission price. Discounted additional passes must be purchased here on this page along with table(s). Discounted vendor passes will NOT be available at the event. Vendor passes will NOT be mailed. You will receive an email 3-4 weeks before the event with further information and your passes can be picked up at the registration booth located at the event during vendor check-in hours.